Lassi is a traditional yogurt drink that has its origin in Punjab, in the Northern part of India. Sweet mint lassi is a variation of the ever popular sweet lassi. Mint leaves give flavor and a great refreshing taste to this drink. It is a refreshing drink and has many additional health benefits too. So here is my version of sweet mint lassi. Put yogurt with mint leaves & sugar in a blender jar. Blend till it becomes a smooth texture. 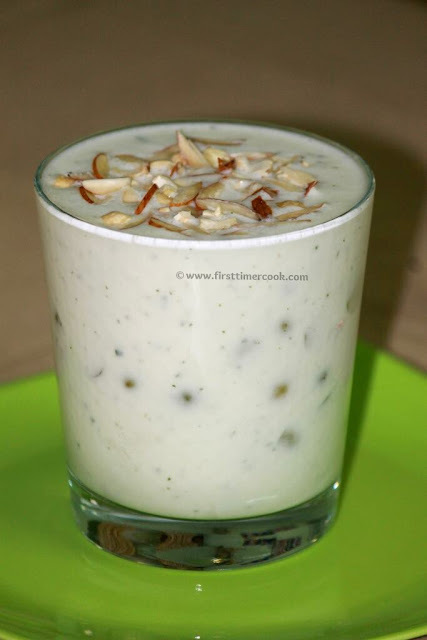 Pour mint lassi into a serving glass with few ice cubes, sprinkle some chopped nuts on top and serve immediately ! ​The quantity of sugar can be increased / decreased as desire. It can store in fridge for 1-2 days. This can be in a salty version (Mint Lassi (Salty)).